Baldwin, Long Island, New York, U.S.
Melanie Adele Martinez (born April 28, 1995) is an American singer, songwriter, music video director, and photographer. Born in Astoria, Queens and raised in Baldwin, New York on Long Island, she first participated in the MSG Varsity Talent Show during her junior year of high school, and subsequently rose to prominence in 2012 after appearing on the American television vocal talent show The Voice. She auditioned singing Britney Spears's "Toxic", and made it to the Top 6 before being eliminated in the fifth week of live shows. Immediately following her departure from the show, she began independent work on original material. Having been a fan favorite, she was heavily supported by fans, and produced her first music video for her single, "Dollhouse", her most successful single to date, having been certified platinum by the Recording Industry Association of America (RIAA). Signing to Atlantic Records soon after, she released her debut EP, Dollhouse (2014). Martinez later released her debut studio album Cry Baby (2015), which debuted at number 6 on the Billboard 200 and was certified gold by the RIAA. The three singles from the album had been released in the months leading up to the release of the album. Her second studio album is currently in the works and is expected to be released in January 2018. Martinez is often cited as one of the only major successes of The Voice. Her music mostly revolves around the protagonist of her concept album, Cry Baby, and discusses themes of family disputes, body image, romance, and coming-of-age. She is known for her two-toned hair. Martinez was born on April 28, 1995 in Astoria, Queens to parents of Puerto Rican and Dominican descent. Her family moved to Baldwin, New York on Long Island when Martinez was 4. She listened to Brandy, Britney Spears, Shakira, The Beatles, Tupac Shakur, Biggie Smalls and Christina Aguilera growing up, and claims to have wanted to be a singer from a young age. Martinez attended Plaza Elementary School, crediting her teacher Mr. Nadien with teaching her how to sing, and in kindergarten, Martinez began writing poetry. Martinez has claimed to have not had many friends growing up and to have been a homebody, as she was "very emotional", and found it difficult to explain her feelings, crying when overwhelmed. She used photography and painting as a means of self-expression. Due to her emotionality as a child, she claims to have been referred to as a "cry baby" by others, which sparked the creation of the titular character of her debut album, Cry Baby. She attended Baldwin High School. At the age of 14, Martinez taught herself how to play guitar by studying chord diagrams of songs that she enjoyed, which she found online, and wrote her first song by adding her poetry to one of the chord diagrams, but claims that playing guitar "eventually got stale". During her sophomore year, she won the talent show at Baldwin High School and at the age of 16, after watching 101 Dalmatians, dyed half of her hair blonde, in the same vein as Cruella De Vil. She received criticism from her classmates after appearing on The Voice. In 2012, during her junior year of high school, Martinez participated in the MSG Varsity Talent Show, a televised talent competition. She sang "Money (That's What I Want)" by Barrett Strong and "Shake Me, Wake Me (When It's Over)" by The Four Tops. She was eliminated in the second round. Later in 2012, Martinez auditioned for the third season of The Voice. She had not watched the show herself prior to the audition. The initial, untelevised audition was an open call, held at Javits Center. She recalls that while she and her mother were driving to the audition, her mother's car broke down before they reached the Midtown Tunnel, and the two were forced to "hitchhike" a taxicab in order to get there. Several months after the initial audition, while at Roosevelt Field Mall, Martinez received word that she had advanced to the "second round". She then received multiple callbacks until she was finally selected to audition on the show itself. Martinez auditioned singing Britney Spears's "Toxic". Three of the four judges, Adam Levine, Cee Lo Green and Blake Shelton, hit the "I Want You" button for her. Martinez chose Adam Levine to be her coach. In the Battle Round, Martinez competed against Caitlin Michelle. They performed a duet of the Ellie Goulding song "Lights". Martinez won and moved on to the Knockout Round. Caitlin Michele was stolen by Cee Lo Green and also moved on. In the Knockout Round, Martinez was paired with Sam James. She chose to sing La Roux's "Bulletproof". Levine eliminated James, and Martinez moved on to the Live Rounds as one of the five remaining members of Team Adam. In week one of the Live Rounds, Martinez sang "Hit the Road Jack". Public vote saved Team Adam members Amanda Brown and Bryan Keith. Levine then chose Martinez over Loren Allred and Joselyn Rivera to remain in the competition. In week three, Martinez's performance of "Seven Nation Army" finished the voting period at #10 on the iTunes Top 200 Single Chart, causing her iTunes votes to be multiplied by ten. This occurred again in week four, when "Too Close" ended the voting period at #6. Martinez was eliminated by audience vote in week five, along with the fellow Team Adam member Amanda Brown, leaving Levine with no artists. In response, Martinez said, "I never expected to get this far and this is beyond what I've ever dreamed of. I'm just so glad I got to express who I am as an artist and really touch people's hearts because that was the ultimate goal." After the show, Martinez began working independently on original material, and claims to have spent the majority of 2013 writing said material. She released her debut single, "Dollhouse", on February 9, 2014. She later compared the song's story to that of Edward Scissorhands, saying "[It's] the perfect home with the perfect lawn and they all look the same. But behind each house there’s a screwed up group of people who are hiding being wealth and perfection." Martinez also released a music video for the track, which was fan-funded by an Indiegogo page created by Martinez, and hair, makeup, and shooting were all done by friends of hers. The video's set was based on a dollhouse that Martinez designed and furnished herself, which was also used in the video itself. It has been viewed over 100 million times on YouTube as of January 2017. The song was produced and cowritten by NYC songwriting duo Kinetics & One Love. On April 7, 2014, Martinez was signed to Atlantic Records and announced that she would be going on tour. She released her debut EP, Dollhouse, on May 19, 2014. The album was supposedly inspired by toy sounds. Martinez's single from the EP, "Carousel", was certified also certified gold by the RIAA, and featured in a preview for FX's miniseries American Horror Story: Freak Show. Martinez wrote the song before having heard about the theme of the fourth season of the show, and when informed, had her manager pitch the track to the show's producers a year before the promo aired. She was informed that the song was to be featured in a promo for the show two days before it was released. The song reached number 9 on the Alternative Digital Songs chart. A video for the track was also released. On June 1, 2015, Martinez released the single "Pity Party", which was certified gold by the RIAA, and the chorus of which samples Lesley Gore's "It's My Party". On July 10, 2015, Martinez released the album's second single "Soap". It reached number 12 on the Alternative Digital Songs chart, and number 16 on the Pop Digital Songs chart. "Sippy Cup" followed on July 31, followed by the album 14 days later. Cry Baby was released on August 14, 2015, to critical acclaim. The album debuted at number 6 on the Billboard 200. Martinez released a Christmas-themed single, "Gingerbread Man", in December 2015. She initially released the song on SoundCloud on December 21, 2015 as a "gift for her fans", but later released the track on iTunes on January 29, 2016 as a single. The music video of her song "Cry Baby" was released on March 14, 2016. It was inspired by the 1988 film Alice. The karaoke-style music video for "Alphabet Boy", which Martinez directed, was released on June 2, 2016. Martinez has released double feature videos for "Soap" and "Training Wheels" together, as well as "Tag, You're It" and "Milk and Cookies." 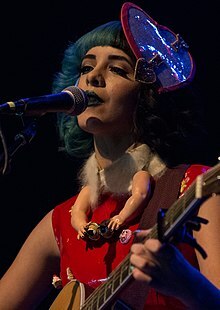 Martinez has finished recording her second album, describing it as the stories of characters living in Cry Baby's neighborhood. In October 2016, she released a commercial for her fragrance called Cry Baby Perfume Milk, adding that the "idea for this perfume has been cultivating in my brain since the moment I finished writing my album." It will be directly distributed by Martinez's record label, Atlantic, making them the first record label to distribute a fragrance. In November 2016, Martinez released her second EP, Cry Baby's Extra Clutter, a physical vinyl release of the bonus tracks from Cry Baby as well as Martinez's single, "Gingerbread Man". She released the music video for her song "Pacify Her" followed in December 2016 by a video for "Mrs. Potato Head". Cry Baby was certified Platinum on February 24, 2017. In March 2017, Martinez expressed her wishes to produce a film telling each song for her second album, explaining "I'm currently writing a film..."i'm going to spend the year working on it, directing, shooting, make up and everything so it's a lot of work". Martinez bases the writing of her songs on their original titles, a list of which she keeps on her phone. The subject matter of her songs are typically based on personal experiences. Martinez describes her own music as "very dark and honest" and "hip hop/trap inspired beats with creepy nostalgic childlike sounds such as baby pianos, music boxes, and toys". Martinez's music has been described by The Guardian as "off-kilter, sweary electropop". Rolling Stone described Martinez's music as "twisted lullabies about love, danger and madness", and compared her music to that of "'Coin-Operated Boy'-era Dresden Dolls" and Lana Del Rey. The New York Times' Jon Pareles described her music as "perchprettily tinkling keyboards and concise pop choruses amid the slow, ominous basslines and twitchy percussion of Southern hip-hop -- a candy-coated variation on the dirges of Lorde and Lana Del Rey," and described her voice as "whispery, sardonic, tearful, furious". Billboard's Jason Lipshutz also compared Martinez to Del Rey and Lorde, saying, "Martinez is clearly cribbing from the dimly lit pop stylings of Lorde and Lana Del Rey, but while her wispy delivery strikes the same femme fatale poses, she lacks the subtlety of her influences," and that "Martinez is admirably ambitious, but her insistence on sticking to [Cry Baby]'s central idea leaves her contorting into uncomfortable positions." The Guardian called her image "doll-like and decidedly emo...hyperreal," and described her music as "part-nursery rhyme, part tragic life story". Martinez describes her alter ego and the protagonist of her debut album, Cry Baby, as a "fairy tale" version of herself. Martinez has cited the Beatles, Neutral Milk Hotel, Feist, Kimbra, Zooey Deschanel, Regina Spektor, and CocoRosie as influences of hers. Specific albums which have influenced her music include The Idler Wheel... by Fiona Apple and Ariana Grande's albums Yours Truly and My Everything. She attributes the "heavy hip-hop influence" in her music to her father playing hip-hop music in the family's house often during her childhood. Martinez cites Mark Ryden, Aleksandra Waliszewska and Nicoletta Ceccoli as her favorite visual artists, saying that they've influenced the visuals in her music videos. She has also named Tim Burton as a large influence of hers, and has said that to make a movie with him would be her "one dream". Martinez collaborated with cosmetics company Lime Crime, Inc. to release two "exclusive" lipsticks: a blue lipstick called "Cry Baby" on August 17, 2015 and a brown lipstick called "Teddy Bear" on March 9, 2016. On October 25, 2016, she released a commercial for a new fragrance called Cry Baby Perfume Milk. It was directly distributed by Martinez's label, the first record label to distribute a fragrance. ^ a b c d e Connolly, Chris. "'Voicing' her thoughts". LI Herald Baldwin. Retrieved 23 July 2016. ^ a b "Talent Show: Getting to know Melanie Martinez". MSG Varsity. Retrieved 22 July 2016. ^ "Melanie Martinez's (18th Birthday Celebration) Stageit Show: Performed Online Live 4/27/13". YouTube. Retrieved 23 November 2014. ^ "Melanie Adele Martinez (eliminated, Round 2)". Retrieved 23 November 2014. ^ "Melanie Martinez Delivers A Twisted Sequel To "Dollhouse": Catch Up With The Family From Hell In "Sippy Cup"". Idolator. July 30, 2015. ^ Parker, Lyndsey. "Melanie Martinez: An Important New Voice". Yahoo Music. Retrieved 20 January 2017. ^ Matta, Madonna (October 27, 2016). "Melanie Martinez on 'The Voice,' 'Cry Baby,' and New Music". Teen Vogue. Condé Nast. ^ a b c DiGiacomo, Frank. "Melanie Martinez on 'Cry Baby,' Not Wanting to Be a Role Model & What She Learned From 'The Voice'". Billboard. Retrieved 18 July 2016. ^ a b Weekly Staff, Us. "Melanie Martinez Doesn't Own Jeans: 25 Things You Don't Know". Us Weekly. Retrieved 18 July 2016. ^ a b c Manders, Hayden. "melanie martinez is queen of the dollhouse". NYLON. Retrieved 21 July 2016. ^ sunnymenagerie (24 February 2014). "Melanie Martinez: From Biggie to Pastels". Golden Mixtape. Retrieved 1 September 2016. ^ a b Hidairi, Niloufar (5 December 2014). "I Took Melanie Martinez on a Date to an Ice Cream Parlour". Noisey. Retrieved 21 July 2016. ^ Yeanopos, Kevin. "Life's a 'Carousel' for rising artist Melanie Martinez". AXS. Retrieved 22 August 2016. ^ Martinez, Chuey. "Next Up Artist of the Week: Melanie Martinez". KIIS FM. Retrieved 30 August 2016. ^ a b c d e "New Noise: Melanie Martinez". Wonderland Magazine. 18 May 2016. Retrieved 22 August 2016. ^ a b Sciarretto, Amy. "Interview: Melanie Martinez Reveals 'Cry Baby' Secrets". Artist Direct. Retrieved 18 July 2016. ^ a b Ciccone, Rachael. "An Interview with Melanie Martinez: It's Her Party". The Aquarian Weekly. Retrieved 18 July 2016. ^ a b c Masley, Ed. "Melanie Martinez's huge artistic leap from 'The Voice' to 'Cry Baby'". The Arizona Republic. Mi-Ai Parrish. Retrieved 22 July 2016. ^ a b c Johnston, Maura. "10 New Artists You Need to Know: September 2015". Rolling Stone. Retrieved 22 July 2016. ^ a b c Gamboa, Glenn. "'The Voice' finalist from LI makes big-label debut". Newsday. Retrieved 21 July 2016. ^ Carroll, Leah. "The New Pioneers: Melanie Martinez on Transcending 'The Voice' and Pop's Conventions". Billboard. Retrieved 21 August 2016. ^ a b c O'Hagan, Patrick. "Patrick O'Hagan Interviews Melanie Martinez". Chattanoogan. Retrieved 22 July 2016. ^ a b "melanie martinez : our favorite cry baby". Lime Crime Blog. Retrieved 22 July 2016. ^ a b "Melanie Adele Martinez (eliminated, Round 2)". MSG Varsity. Retrieved 22 July 2016. ^ "Baldwin's Melanie Martinez lands spot on the voice". Newsday. Retrieved 27 November 2013. ^ "iTunesCharts.net: US Songs Tuesday, 20th November 2012". Retrieved 23 November 2014. ^ "iTunesCharts.net: US Songs Tuesday, 27th November 2012". Retrieved 23 November 2014. ^ Elkin, Jaimie (4 December 2012). "'The Voice' Top 4 Revealed: Melanie Martinez And Amanda Brown Eliminated". Huffington Post. Retrieved 27 November 2013. ^ McRady, Rachel. "Voice's First Breakout? Melanie Martinez Releases Haunting New Single". Us Weekly. Retrieved 22 August 2016. ^ Boise, Danielle (2 June 2014). "Interview with Melanie Martinez on 'Dollhouse' EP and Life out on the Road". Target Audience Magazine. Retrieved 22 August 2016. ^ Min, Lilian (20 November 2015). "In conversation with 'Cry Baby' artist Melanie Martinez". HelloGiggles. Retrieved 21 July 2016. ^ Martinez, Melanie. "Dollhouse first release music video!". Indiegogo. Retrieved 21 July 2016. ^ Berrien, Jon (28 May 2014). "Interview: "Dollhouse" singer Melanie Martinez plays nice with GroundSounds". GroundSounds. Retrieved 1 September 2016. ^ "Dollhouse". warnerchappell.com. Retrieved 15 August 2015. ^ a b "Melanie Martinez Opens Her "Dollhouse"; Celebrated Singer/Songwriter Sets Debut EP, Showcased by Haunting New Single, "Dollhouse"". Yahoo Finance. 7 April 2014. Retrieved 23 November 2014. ^ "'Dollhouse' in hand, Melanie Martinez plans shows in the area". Idol Chatter & Voice Views. Retrieved 23 November 2014. ^ a b Gioino, Catherine. "Melanie Martinez Talks New Album 'Cry Baby'". The Knockturnal. Retrieved 1 September 2016. ^ Stone, Avery (6 October 2014). "How This Eerie Song Wound Up In The 'Freak Show' Trailer". The Huffington Post. Retrieved 22 August 2016. ^ a b c "Melanie Martinez - Chart history | Billboard". www.billboard.com. Retrieved 2016-04-25. ^ "Melanie Martinez Teases Debut LP 'Cry Baby' With A Delightfully Depressing "Pity Party": Watch". Music News, Reviews, and Gossip on Idolator.com. Retrieved 15 August 2015. ^ "Listen: Melanie Martinez – "Soap"". Trendio. Retrieved 15 August 2015. ^ "Video: Melanie Martinez – "Sippy Cup"". Trendio. Retrieved 15 August 2015. ^ "Melanie Martinez Details the Inspiration Behind her Debut Album 'Cry Baby' - KTLA". KTLA. Retrieved 15 August 2015. ^ "Talib Kweli, Nada Surf, Melanie Martinez and More Music Reviews". ABC News. 2015-08-19. Retrieved 2016-04-25. ^ "SPIN Pop Report: Melanie Martinez Loads Her Sippycups With Booze". Spin. Retrieved 2016-04-25. ^ Pareles, Jon (2015-09-13). "Review: Melanie Martinez Performs 'Cry Baby' and Other Songs From Her Debut Album". The New York Times. ISSN 0362-4331. Retrieved 2016-04-25. ^ Martinez, Melanie. "Gingerbread Man - Single". iTunes. Retrieved 21 July 2016. ^ Martinez, Melanie. "Gingerbread Man". SoundCloud. Retrieved 21 July 2016. ^ "Melanie Martinez Gets Delivered by a Doctor in a Rabbit Mask in 'Cry Baby' Video: Watch". Billboard. Retrieved 14 March 2016. ^ Joseph, Jonathan (23 March 2016). "Interview With: Melanie Martinez". Bestfan. Retrieved 1 September 2016. ^ Gaca, Anna (2 June 2016). "Melanie Martinez's 'Cry Baby' Fright Fest Continues With 'Alphabet Boy' Video | SPIN". Spin. Retrieved 24 August 2016. ^ Apaza, Kevin. "Melanie Martinez Premieres 7-Minute "Tag, You're It / Milk And Cookies" Music Video: Watch". Direct Lyrics. Retrieved 24 August 2016. ^ a b Weatherby, Taylor. "Melanie Martinez Unveils New Fragrance, Cry Baby Perfume Milk: Exclusive". Billboard. Retrieved 25 October 2016. ^ "Melanie Martinez releases new music video for "Mrs. Potato Head"—watch - News - Alternative Press". Alternative Press. Retrieved 2016-12-02. ^ "Melanie Martinez's 'Pacify Her' Video Is Exactly What You'd Expect: Beautiful & Freaky". Billboard. Retrieved 2016-12-02. ^ Cantor, Brian (2 March 2017). "Melanie Martinez' "Cry Baby" Album Certified Platinum". Headline Planet. Retrieved 2 March 2017. ^ PRESS, GOLDEN BOY. "MELANIE MARTINEZ Interview #109...". Golden Boy Press. Retrieved 22 August 2016. ^ Mania, Greg (19 April 2014). "Melanie Martinez Dollhouse Video -". creem magazine. Retrieved 30 August 2016. ^ a b Davies, Hannah J. (9 May 2016). "Melanie Martinez review – Electropop meshing the hyperreal and the real". The Guardian. Guardian Media Group. Retrieved 30 August 2016. ^ Pareles, Jon (13 September 2015). "Review: Melanie Martinez Performs 'Cry Baby' and Other Songs From Her Debut Album". The New York Times. Retrieved 22 July 2016. ^ Lipshutz, Jason (29 August 2015). "'The Voice' Star Melanie Martinez's Ambitious Concept Album 'Cry Baby' Fizzles: Album Review". Billboard. 127 (25). Retrieved 30 August 2016. ^ Nelson, Gabi. "Girl Crush: Melanie Martinez". Valfre. Retrieved 1 September 2016. ^ Kruczyk, Lauren (August 19, 2016). "No Pity Party Here — Melanie Martinez's Cry Baby Hits #1 on the Alternative Albums Chart". The Huffington Post. Retrieved October 14, 2016. ^ Wass, Mike (30 November 2015). "Melanie Martinez On Concept Albums & The Future Adventures Of Cry Baby: Idolator Interview | Idolator". Idolator. Retrieved 18 July 2016. ^ Rodriguez, Priscilla. "EXCLUSIVE: Melanie Martinez Talks About Her Journey After 'The Voice'". Latina. Retrieved 1 September 2016. ^ Deere, Doe. "Cry Baby". Lime Crime, Inc. Retrieved 16 July 2016.